This is Megan, my aide, and me! We took a class picture and I will print it out and post it on the board. 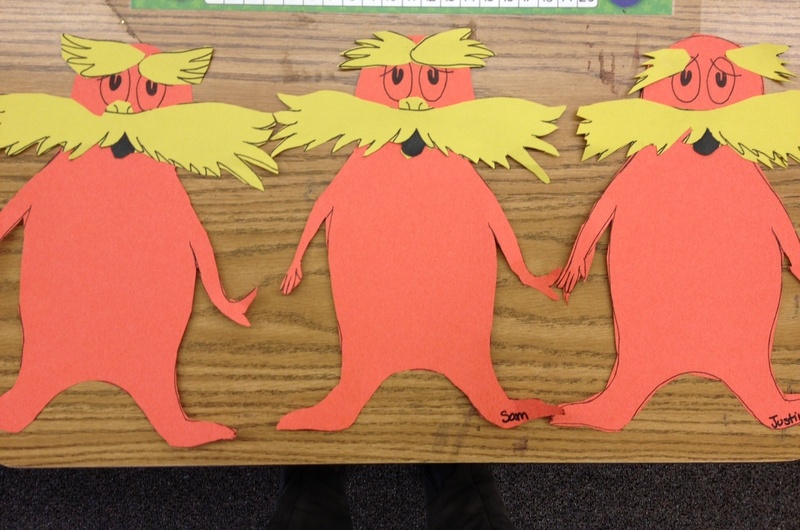 Here is our bulletin board with Truffula trees. 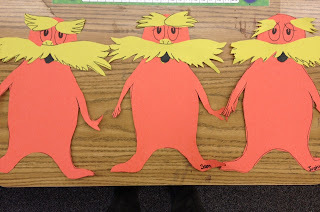 We made this Lorax craft, and tomorrow we will write on his belly things we can do to "save the earth." Tomorrow, we will put the Lorax up on the board too. This background was perfect to take pictures in front of today though! Oh my! Hilarious! I want to make one! I would love if you would come and share a link to this post on my blog, Happy Birthday Author. I have a linky that is collecting ideas to celebrate Dr. Seuss’s birthday. OOH SUPER cute!! I might have to do that with my boys tomorrow!! Thanks for sharing with me! What a great idea! Super cute- love these. Need to remember for next year. Those are cute! I am a new follower and I am so doing those this week! This looks familiar :o) Great teachers think alike.